Another Affordable Agility exclusive! The window jump is a unique obstacle sometimes used in UKC trials and AKC trials. Of course its more well-known use is for training Police K-9 dogs. The window jump is a particular challenge to dogs because of the higher degree of accuracy it demands. Our innovative design is fully adjustable in 2" increments and features a method of rolling the panel (like a roller blind shade) to adjust the height. (It rolls around the bottom bar). The frame itself also adjusts smaller in size when the panel is rolled up! The adjustment pins are attached to the unit so you will not lose them. The window panel is made of a heavy-duty reinforced canvas that is completely waterproof. Because it is fabric, it is also safer than a wood surface (and of course lighter). The window opening is 18" wide and 30" high. Directions are amazingly simple to understand, and it contains descriptive pictures for assembly and use. 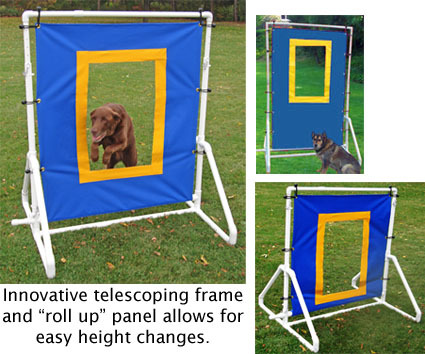 Information on training your dog to master the window jump is also included.